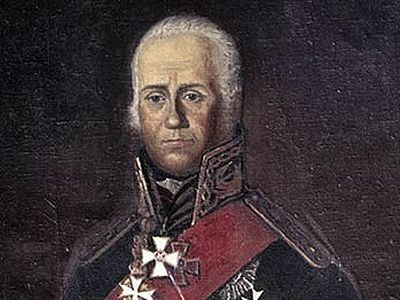 “The fight was ruthless, but for us it was all the more glorious… Rear Admiral Ushakov attacked the enemy, twice as strong as us… he strongly crushed them and chased them until night… Rear Admiral Ushakov is of excellent merits. 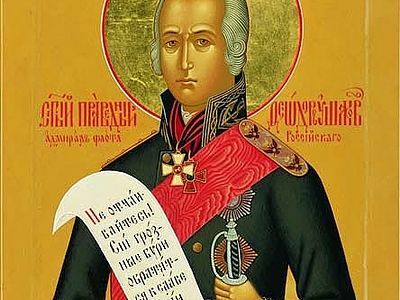 I am certain that he will be a great naval leader”—thus Prince Potemkin’s report to Catherine II characterized the valor and bravery of the holy and righteous warrior Feodor Ushakov. Of course, there are other characteristics of the virtuous personality of this holy warrior. We know that he “always gave alms and a helping hand to the poor and destitute;” in the Patriotic War of 1812, he gave away everything he had “to the aid of others, suffering from the ruin of the evil enemy…” and, finally, “the rest of his day, the admiral spent quite temperately, and ended his life as befits a true Christian and faithful son of the holy Church.” And when the coffin with the reposed admiral’s body was carried by hand through the city, with a large confluence of people, they wanted to place it on a cart, but the people continued to carry him all the way to Sanaxar Monastery—the place of his repose. The combination of such seemingly different concepts as “military service” and “holiness and righteousness” often cast even deep believers into confusion. Various critical statements on this question by the advocates of “the true Gospel of love” only increase the perplexity. The question is really serious: How to combine military service with the image of holiness that we learn from the Gospels? What is the Church’s logic in this case? First of all, we must realize that the Church always relies in its judgments on a true assessment of reality and the correct correlation of the visible and the real. The basis for this view of the world is the Gospel, and it decisively and definitively speaks about how the realities of earthly life very often distort even the very best of intentions, turning them towards man’s destruction. With dread we hear from the lips of the Savior that the time cometh, that whosoever killeth you will think that he doeth God service (Jn. 16:2). The words of the loving Savior are quite unexpected for us: Think not that I am come to send peace on earth: I came not to send peace, but a sword. For I am come to set a man at variance against his father, and the daughter against her mother, and the daughter in law against her mother in law (Mt. 10:34-35). Finally, we are perplexed, hearing, Not every one that saith unto me, Lord, Lord, shall enter into the Kingdom of Heaven; but he that doeth the will of My Father Which is in Heaven. Many will say to Me in that day, Lord, Lord, have we not prophesied in Thy name? and in Thy name have cast out devils? and in Thy name done many wonderful works? And then will I profess unto them, I never knew you: depart from Me, ye that work iniquity (Mt. 7:21-23). It turns out that those who worked many miracles by the name of the Lord, driving out demons, can in the end be acknowledged by God as “workers of iniquity.” That is to say, even the most correct criterion, by which we often evaluate the truth of our relationships with others, is love, and it, it turns out, can be distorted, inasmuch as He that loveth father or mother more than Me is not worthy of Me: and he that loveth son or daughter more than Me is not worthy of Me (Mt. 10:37). The combination of military bravery with holiness is possible in the context of the Gospel’s perception of the realities of our world. The Church allows such a combination inasmuch as it bears witness that man’s earthly life is far from paradisaical conditions. Here, even love and sincere intentions cannot be the final criteria for the true path. In our lives, everything true is the fruit of efforts, of struggle, of overcoming, including inevitable falls and the defense of the weak, and the upholding of Christian values. This world is impossible to evaluate based only on our own sincere convictions to defend truth alone, as the Lord Himself warns us all: Take heed therefore that the light which is in thee be not darkness (Lk. 11:35). The Gospel has no flat assessment of earthly realities. The Lord clearly shows that He understands the difficulty of our lives when He says, Woe unto the world because of offences! for it must needs be that offences come… (Mt. 18:7). And He warns us to not dare to judge others and ourselves with the help of criteria, the truth of which is determined on the basis of personal experience or good intentions. Unfortunately, there are many necessary things in the world to which man is obliged to react and answer. And these necessary answers and obliged uses of force and mind do not contradict the Gospel. The Savior clearly speaks about this: Render to Caesar the things that are Caesar's, and to God the things that are God's (Mk. 12:17). Everything is not so simple and unambiguous with us, that we can fully trust something coming from our own hearts. Love is for us largely incomprehensible and unattainable. It is not as delicate and innocuous as we think, because it brings a sword and division into the world (cf. Mt. 10:34-35). We must travel a long path towards love, to overcome ourselves and incorrect attitudes towards the world, which very easily replace truth. Therefore, the Church looks at our lives, based on the Gospel realism of man’s fight with his desire to validate himself in everything. Its experience warns against irreversible mistakes on this path: “The premature desire to develop a sense of love for God is self-delusion. The move towards Christ begins and ends under the leadership of the fear of God” (St. Ignatius Brianchaninov). In this sense, the possibility of the combination of military service with holiness is a confirmation of the truth of Orthodoxy, preserved by Gospel realism. The Church recognizes that the criteria of the truth path to the Kingdom of Heaven is not external relations with the world, their formal aspects, but the correctness of orientations, the light of Christ, that can overcome any cover of circumstances and by its rays reach to the very depths of worldly vanity and worldly temptations, if only there is a heart there, thirsting to see it. 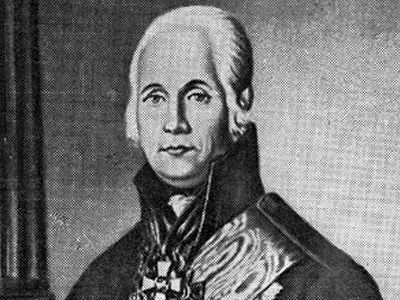 A monument to Admiral Fyodor Ushakov, a legendary Russian Navy commander, was unveiled on the Greek island of Zakynthos on Sunday.